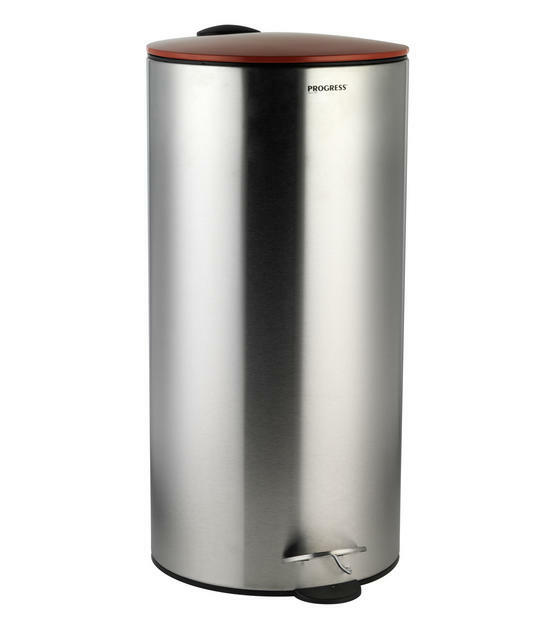 An essential item for your kitchen at home, this Progress pedal bin has a 30 litre capacity to provide maximised hold for your rubbish and waste. Measuring at 29 x 60 cm, the bin will neatly fit into small corners and any areas where you have limited space. With a convenient foot pedal for easy everyday use, you will be able to effortlessly empty the bin when it is full. The bin also features a soft closing lid, for advanced hygiene and to avoid trapping your fingers as you tidy any mess away. The perfect addition to your kitchen at home, this Progress pedal bin has a sleek silver finish to match any style or colour scheme. Made from brilliantly durable and strong stainless steel, the bin is also incredibly easy to wipe clean in case you have any spills. With a lovely rounded design, the bin has a generous 30 litre capacity for efficiently storing your rubbish, recycling or food waste. The bin features a smart soft closing lid for effortless hygiene, safety and convenience whilst keeping your home wonderfully clean. Simply by stepping onto the foot pedal to open the secure lid, you will be able to empty your rubbish and replace bin bags in seconds.